The QMainWindow class provides a main application window. A main window provides a framework for building an application's user interface. Qt has QMainWindow and its related classes for main window management. QMainWindow has its own layout to which you can add QToolBars, QDockWidgets, a QMenuBar, and a QStatusBar. The layout has a center area that can be occupied by any kind of widget. You can see an image of the layout below. Note: Creating a main window without a central widget is not supported. You must have a central widget even if it is just a placeholder. A central widget will typically be a standard Qt widget such as a QTextEdit or a QGraphicsView. Custom widgets can also be used for advanced applications. You set the central widget with setCentralWidget(). Main windows have either a single (SDI) or multiple (MDI) document interface. You create MDI applications in Qt by using a QMdiArea as the central widget. We will now examine each of the other widgets that can be added to a main window. We give examples on how to create and add them. Qt implements menus in QMenu and QMainWindow keeps them in a QMenuBar. QActions are added to the menus, which display them as menu items. You can add new menus to the main window's menu bar by calling menuBar(), which returns the QMenuBar for the window, and then add a menu with QMenuBar::addMenu(). QMainWindow comes with a default menu bar, but you can also set one yourself with setMenuBar(). If you wish to implement a custom menu bar (i.e., not use the QMenuBar widget), you can set it with setMenuWidget(). The createPopupMenu() function creates popup menus when the main window receives context menu events. The default implementation generates a menu with the checkable actions from the dock widgets and toolbars. You can reimplement createPopupMenu() for a custom menu. Toolbars are implemented in the QToolBar class. You add a toolbar to a main window with addToolBar(). You control the initial position of toolbars by assigning them to a specific Qt::ToolBarArea. You can split an area by inserting a toolbar break - think of this as a line break in text editing - with addToolBarBreak() or insertToolBarBreak(). You can also restrict placement by the user with QToolBar::setAllowedAreas() and QToolBar::setMovable(). The size of toolbar icons can be retrieved with iconSize(). The sizes are platform dependent; you can set a fixed size with setIconSize(). You can alter the appearance of all tool buttons in the toolbars with setToolButtonStyle(). Dock widgets are implemented in the QDockWidget class. A dock widget is a window that can be docked into the main window. You add dock widgets to a main window with addDockWidget(). There are four dock widget areas as given by the Qt::DockWidgetArea enum: left, right, top, and bottom. You can specify which dock widget area that should occupy the corners where the areas overlap with setCorner(). By default each area can only contain one row (vertical or horizontal) of dock widgets, but if you enable nesting with setDockNestingEnabled(), dock widgets can be added in either direction. Two dock widgets may also be stacked on top of each other. A QTabBar is then used to select which of the widgets that should be displayed. You can set a status bar with setStatusBar(), but one is created the first time statusBar() (which returns the main window's status bar) is called. See QStatusBar for information on how to use it. QMainWindow can store the state of its layout with saveState(); it can later be retrieved with restoreState(). It is the position and size (relative to the size of the main window) of the toolbars and dock widgets that are stored. See also QMenuBar, QToolBar, QStatusBar, QDockWidget, Application Example, Dock Widgets Example, MDI Example, SDI Example, and Menus Example. This enum contains flags that specify the docking behavior of QMainWindow. QMainWindow::AnimatedDocks 0x01 Identical to the animated property. QMainWindow::AllowNestedDocks 0x02 Identical to the dockNestingEnabled property. QMainWindow::AllowTabbedDocks 0x04 The user can drop one dock widget "on top" of another. The two widgets are stacked and a tab bar appears for selecting which one is visible. QMainWindow::ForceTabbedDocks 0x08 Each dock area contains a single stack of tabbed dock widgets. In other words, dock widgets cannot be placed next to each other in a dock area. If this option is set, AllowNestedDocks has no effect. QMainWindow::VerticalTabs 0x10 The two vertical dock areas on the sides of the main window show their tabs vertically. If this option is not set, all dock areas show their tabs at the bottom. Implies AllowTabbedDocks. These options only control how dock widgets may be dropped in a QMainWindow. They do not re-arrange the dock widgets to conform with the specified options. For this reason they should be set before any dock widgets are added to the main window. Exceptions to this are the AnimatedDocks and VerticalTabs options, which may be set at any time. The DockOptions type is a typedef for QFlags<DockOption>. It stores an OR combination of DockOption values. This property holds whether manipulating dock widgets and tool bars is animated. When a dock widget or tool bar is dragged over the main window, the main window adjusts its contents to indicate where the dock widget or tool bar will be docked if it is dropped. Setting this property causes QMainWindow to move its contents in a smooth animation. Clearing this property causes the contents to snap into their new positions. By default, this property is set. It may be cleared if the main window contains widgets which are slow at resizing or repainting themselves. Setting this property is identical to setting the AnimatedDocks option using setDockOptions(). This property holds whether docks can be nested. 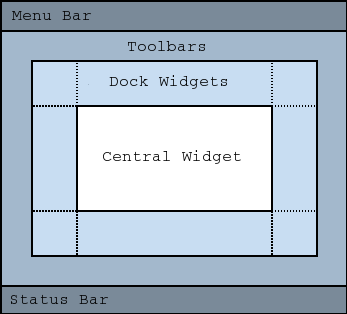 If this property is false, dock areas can only contain a single row (horizontal or vertical) of dock widgets. If this property is true, the area occupied by a dock widget can be split in either direction to contain more dock widgets. Dock nesting is only necessary in applications that contain a lot of dock widgets. It gives the user greater freedom in organizing their main window. However, dock nesting leads to more complex (and less intuitive) behavior when a dock widget is dragged over the main window, since there are more ways in which a dropped dock widget may be placed in the dock area. Setting this property is identical to setting the AllowNestedDocks option using setDockOptions(). This property holds the docking behavior of QMainWindow. The default value is AnimatedDocks | AllowTabbedDocks. This property holds size of toolbar icons in this mainwindow. The default is the default tool bar icon size of the GUI style. Note that the icons used must be at least of this size as the icons are only scaled down. This property holds style of toolbar buttons in this mainwindow. This property holds whether the window uses the unified title and toolbar look on Mac OS X. This property is false by default and only has any effect on Mac OS X 10.4 or higher. If set to true, then the top toolbar area is replaced with a Carbon HIToolbar and all toolbars in the top toolbar area are moved to that. Any toolbars added afterwards will also be added to the Carbon HIToolbar. This means a couple of things. If you call showFullScreen() on the main window, the QToolbar will disappear since it is considered to be part of the title bar. You can work around this by turning off the unified toolbar before you call showFullScreen() and restoring it after you call showNormal(). Setting this back to false will remove these restrictions. The Qt::WA_MacBrushedMetal attribute takes precedence over this property. Constructs a QMainWindow with the given parent and the specified widget flags. Adds the given dockwidget to the specified area. Adds dockwidget into the given area in the direction specified by the orientation. Adds the toolbar into the specified area in this main window. The toolbar is placed at the end of the current tool bar block (i.e. line). If the main window already manages toolbar then it will only move the toolbar to area. See also insertToolBar(), addToolBarBreak(), and insertToolBarBreak(). Creates a QToolBar object, setting its window title to title, and inserts it into the top toolbar area. Adds a toolbar break to the given area after all the other objects that are present. Returns the central widget for the main window. This function returns zero if the central widget has not been set. Returns the dock widget area that occupies the specified corner. Returns a popup menu containing checkable entries for the toolbars and dock widgets present in the main window. If there are no toolbars and dock widgets present, this function returns a null pointer. By default, this function is called by the main window when the user activates a context menu, typically by right-clicking on a toolbar or a dock widget. If you want to create a custom popup menu, reimplement this function and return a newly-created popup menu. Ownership of the popup menu is transferred to the caller. See also addDockWidget(), addToolBar(), and menuBar(). Returns the Qt::DockWidgetArea for dockwidget. If dockwidget has not been added to the main window, this function returns Qt::NoDockWidgetArea. See also addDockWidget(), splitDockWidget(), and Qt::DockWidgetArea. This signal is emitted when the size of the icons used in the window is changed. The new icon size is passed in iconSize. You can connect this signal to other components to help maintain a consistent appearance for your application. Inserts the toolbar into the area occupied by the before toolbar so that it appears before it. For example, in normal left-to-right layout operation, this means that toolbar will appear to the left of the toolbar specified by before in a horizontal toolbar area. See also insertToolBarBreak(), addToolBar(), and addToolBarBreak(). Inserts a toolbar break before the toolbar specified by before. Returns the menu bar for the main window. This function creates and returns an empty menu bar if the menu bar does not exist. Returns the menu bar for the main window. This function returns null if a menu bar hasn't been constructed yet. Removes the dockwidget from the main window layout and hides it. Note that the dockwidget is not deleted. Removes the toolbar from the main window layout and hides it. Note that the toolbar is not deleted. Removes a toolbar break previously inserted before the toolbar specified by before. Restores the state of dockwidget if it is created after the call to restoreState(). Returns true if the state was restored; otherwise returns false. Restores the state of this mainwindow's toolbars and dockwidgets. The version number is compared with that stored in state. If they do not match, the mainwindow's state is left unchanged, and this function returns false; otherwise, the state is restored, and this function returns true. Saves the current state of this mainwindow's toolbars and dockwidgets. The version number is stored as part of the data. To restore the saved state, pass the return value and version number to restoreState(). Sets the given widget to be the main window's central widget. Note: QMainWindow takes ownership of the widget pointer and deletes it at the appropriate time. Sets the given dock widget area to occupy the specified corner. Sets the menu bar for the main window to menuBar. Note: QMainWindow takes ownership of the menuBar pointer and deletes it at the appropriate time. QMainWindow takes ownership of the menuBar pointer and deletes it at the appropriate time. Sets the status bar for the main window to statusbar. Setting the status bar to 0 will remove it from the main window. Note that QMainWindow takes ownership of the statusbar pointer and deletes it at the appropriate time. Splits the space covered by the first dock widget into two parts, moves the first dock widget into the first part, and moves the second dock widget into the second part. The orientation specifies how the space is divided: A Qt::Horizontal split places the second dock widget to the right of the first; a Qt::Vertical split places the second dock widget below the first. Note: if first is currently in a tabbed docked area, second will be added as a new tab, not as a neighbor of first. This is because a single tab can contain only one dock widget. Note: The Qt::LayoutDirection influences the order of the dock widgets in the two parts of the divided area. When right-to-left layout direction is enabled, the placing of the dock widgets will be reversed. See also tabifyDockWidget(), addDockWidget(), and removeDockWidget(). Returns the status bar for the main window. This function creates and returns an empty status bar if the status bar does not exist. Moves second dock widget on top of first dock widget, creating a tabbed docked area in the main window. Returns the Qt::ToolBarArea for toolbar. If toolbar has not been added to the main window, this function returns Qt::NoToolBarArea. See also addToolBar(), addToolBarBreak(), and Qt::ToolBarArea. Returns whether there is a toolbar break before the toolbar. See also addToolBarBreak() and insertToolBarBreak(). This signal is emitted when the style used for tool buttons in the window is changed. The new style is passed in toolButtonStyle.